This Sample Pack includes the Standard sizes: 1/2”, 5/8”, 3/4”, 7/8”, 1”, and 1 1/8” widths. Shorty sizes: 1/2”, 3/4”, and 7/8” widths are also included. 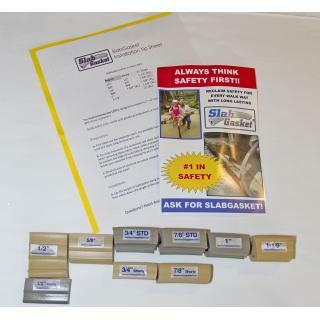 This Free Sample Pack of SlabGasket™ will allow you to test fit the various sizes of SlabGasket™ to insure a correct snug fit for your expansion joint replacements. This Free Sample Pack includes both Gray and Almond color samples, as well as standard height and shorty height samples. A small (fully refundable) shipping charge will apply during checkout. After receiving your Free Sample Pack, if you return and purchase 30 feet (or greater) of SlabGasket, we will fully refund the Sample Pack shipping charge! 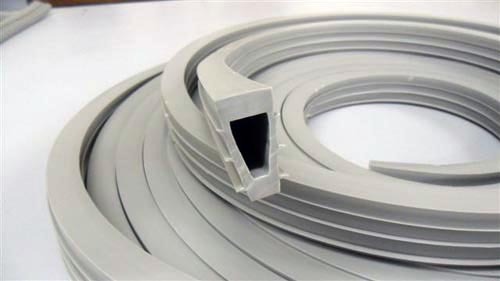 SlabGasket™ is an extruded, flexible pvc vinyl, the same material used in vinyl shutters, doors, windows, and siding. Immediately effective once installed, no waiting or curing is necessary. To order, select the QUANTITY of Free Sample Packs in the space below and click ADD TO CART. The Free Sample Pack will include both Gray and Almond color samples. SlabGasket Sample Packs are also available with the larger sizes (SlabGasket XL Sample Pack) for joints wider than 1 1/8” up to 2”.